The parent company of Circle K, Couche-Tard, has had a run on its stock of late. It is trading at all-time highs, making the last co-founder of the Canadian company and former CFO a billionaire. Richard Fortin's shares in Couche-Tard along with smaller holdings and the cash he's made from dividends and share sales have pushed his net worth to just over $1 billion. Fortin, who sits on the board of Couche-Tard, is the third person to become a billionaire thanks to Circle K. The convenience store operates in Canada, the U.S., and Europe. Chairman and retired CEO Alain Bouchard has been a billionaire since 2012 and board member Jacques D'Amours has been in the ranks of billionaires since 2015. As of this writing, shares of Couche-Tard are trading at $80.52 CAD. Earnings for the company's most recent quarter are up 26.9% and shares are up more than 35% over the past year. Worldwide, the company has more than $50 billion in revenue and $1.7 billion in net earnings for the fiscal year 2018. Analysts believe the stock has been undervalued and it was high time for it to rise in value. Couche-Tard operates about 8,700 gas stations. The rise in popularity of electric cars could cut into that profit center. However, EVs are not dominating highways yet. 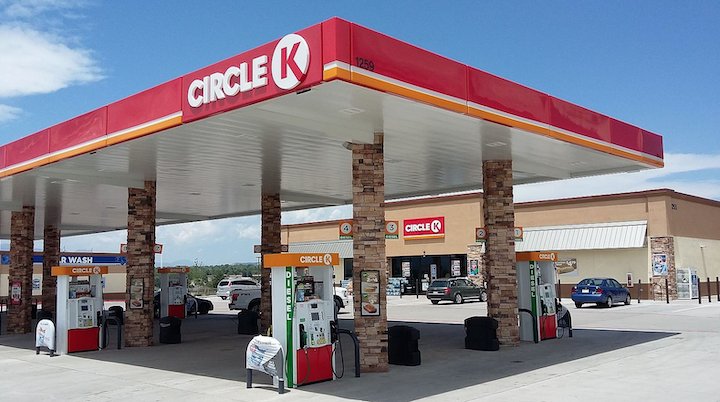 Circle K has had strong same store sales performance in the last quarter which helps alleviate the concerns of investors. The convenience store is up 4.9% in Canada and 4.5% in the U.S. largely fueled by the sale of e-cigarettes and other tobacco products. Couche-Tard was founded in 1980 as a single convenience store in Laval, Quebec. Couche-Tard has grown by leaps and bounds thanks to acquisitions. The company acquired 11 stores in 1985 and spent the next 15 years buying up its competitors. By 2000, Couche -Tard was on nearly every Canadian street corner with 1,600 stores and more than 11,000 employees. The company acquired U.S. based Circle K in 2003 after the chain went into bankruptcy protection in 1990 and several owners before landing under the Couche-Tard umbrella. Circle K has more than 15,000 locations today. Richard Fortin is a golf and fishing enthusiast who also has stakes in Canadian packaging and publishing company Transcontinental and the National Bank of Canada. His charitable foundation is funded by 240,000 Class B Couche-Tard shares worth about $14 million. The Foundation Lise e Richard Fortin's mission is to provide assistance for the elderly and services for children who are survivors of sexual assault.